This year, the Congregation of the Oratory celebrates the 500th anniversary of the birth of its founder, St Philip Neri. 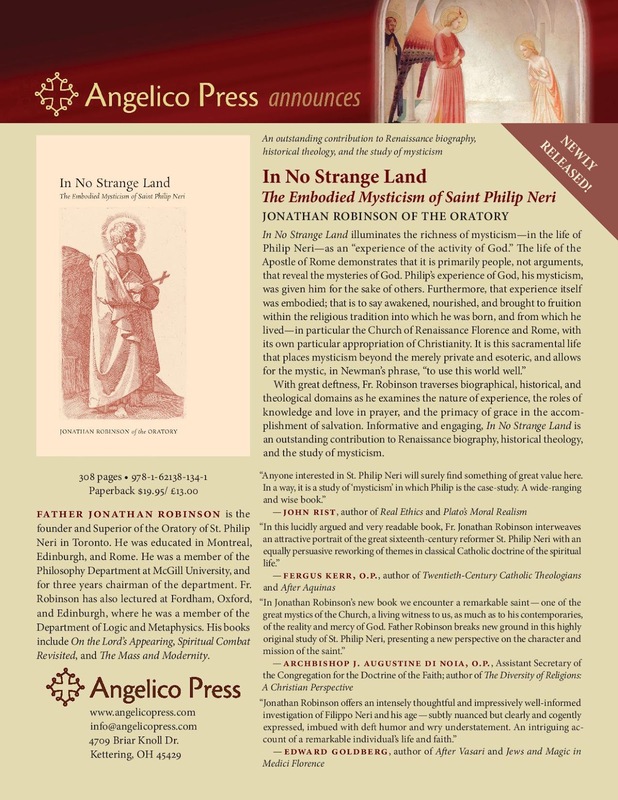 Fr Jonathan Robinson, founder and superior of the Toronto Oratory, has just published a new book called “In No Strange Land - The Embodied Mysticism of St Philip Neri” through Angelico Press. We are grateful to Catholic journalist David Warren for offering us this review of it; Mr Warren is a regular contributor to The Catholic Thing, and has his own blog called Essays in Idleness. Jonathan Robinson (founder of the Toronto Oratory) has written a remarkable book on the founder of the Oratorians. It is not a biography or hagiography, not history, not philosophy or theology, nor any established genre of academic research. There are strands from all these, however, and they are certainly wound together into a vivid portrait. 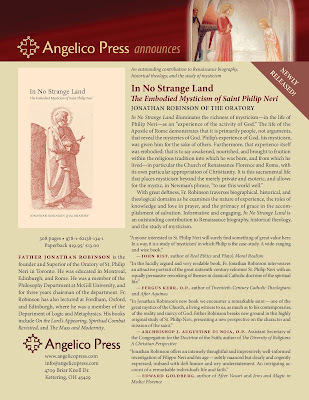 In No Strange Land carries the subtitle, The Embodied Mysticism of Saint Philip Neri. The author of several outstanding previous works on the foundations of Christian life, Father Robinson has also drawn together his own life’s work in this latest volume. The Saints are “like Christ” not in emulating this trait or that from the Gospel record, nor for what they “objectively” taught or achieved, in the service of the Church that Christ founded. The diversity of “flavours” is extraordinary. The more we learn of each Saint, the less he seems like any other Saint, the more sui generis. Keep up the study, and we come to realize that each is “like Christ” in a more radical or fundamental way; the very embodiment of something, not of his own making. Saint Philip Neri was, for instance, a younger contemporary of Saint Ignatius Loyola, founder of the Jesuits. It is hard to imagine two men of such contrasting backgrounds and personalities, yet in the service of the same larger cause -- Ignatius a late apostle, “to the world”; Philip, “to Rome.” Moreover, the Orders they founded, respectively, continue to this day to reflect the character of their respective founders. Even their faults correspond to their originating virtues, so that the “family resemblances” remain stark. This, if one stops to think of it, is something miraculous in kind, for secular organizations take on a life of their own, and “evolve” along lines that their founders could scarcely anticipate or any longer recognize, often within their own lifespan. In his inquiry into the name and nature of Philip Neri, Father Robinson touches on such points. He is hardly writing an institutional history of the Oratory; he is focused entirely on the man himself; yet the story he is telling is also that Oratory story -- told from inside. The peculiar form and vocation of Oratory life is constantly expounded, and exemplified, right down to the wry humour and gentleness of tone, the instinctive respect for literature and “culture” in music and art, the strikingly independent sense of mission -- all conveyed in the texture of the book. It is warm, in a special Philip-Neri way; one is not so much in a uniformed hierarchy as among friends, bound together in a common adventure. We speak of “trusting in God,” which is a reasonable expression, but in the life of Philip Neri as Father Robinson unfolds it there is a consistent movement to something much deeper. It is a movement of faith towards or into the embrace of Christ that goes far beyond mere “trust,” which can be reduced to an intellectual idea. The future Saint Philip is born and raised in a family environment quite specific to Florence in 1515 AD. He has a somewhat errant father, a mother with society connexions, and access to extremely good schooling with the Dominicans at San Marco, there. He is in an environment haunted by the legacy of Savonarola, and we have glimpses of the significance of this. Father Robinson’s own learning takes us to the streets of Renaissance Florence. We can get only the most murky glimpses of young Philip, from the historical record, yet what we can infer of his formation is surprisingly substantial. He’d been apprenticed in trade to a formidably rich but childless uncle, at San Germano near Naples, who was impressed with the lad’s smarts, his energy and shrewdness, and was eager to make him his heir. Philip had it made, in a world that respected money and pretty things perhaps more than we can imagine today. And he could always go to church on Sundays. But now in the shadow of Monte Cassino, he turns away. For San Germano was near Monte Cassino: the young Philip was at first enchanted, by the sight of her Benedictine monks, and the thought of their library. He’d visit their little mountain chapel, in a cleft of rock above the harbour at Gaeta. Outwardly disciplined and cautious, though hardly shy, he was nevertheless, within, a footloose pilgrim character, born for the open road. His uncle let him go, with regret, and no doubt with puzzlement, for the young man had no alternative career plan. Suddenly God put him on the road to Rome, as Peter and Paul and so many before him. He had some sort of vision, then; other visions, and demonic temptations, throughout his life -- yet he glided through. Outwardly, the picture of sanity and good cheer; inwardly called. Later, praying in the catacombs at Rome, a vision with miraculous physiological effects -- an aneurism, or whatever it was, that left him with (quite literally) an enlarged heart, as from a Love that was exploding. Medical science can never explain such things, and neither can I. The older hagiographies, with their dramatic emphasis on the miracles that kept happening around Saint Philip -- witnessed by many souls -- make awkward reading for the student of today. This is not only because he tends to be crippled by scientistic scepticism. They also strike him as in poor taste. They were conveyed from the start with a baroque ebullience that is too rich for our imagination. We need to bland it down. Father Robinson does not question the veracity of the eyewitnesses of that age. Nor does he glide softly over such material, strictly for the sake of modern readers. Instead, he wishes to remain focused on the inner development of Saint Philip’s “mysticism.” (The term itself is gradually explained throughout the book.) A spectacular case of the three-fold progression is unfurling within Saint Philip -- from purification, through illumination, to union with the divine. We have caught sight of it, and must follow the thread, for here is not some arbitrary miracle associated with our Saint, but the extraordinary miracle happening inside him. Philip has opened himself entirely, and Christ is doing something with him. The Rome he came to, when not quite twenty, was decadent, corrupt. Again, Father Robinson has the facility to summon the era with a few deft strokes, and present an image to us of the man we are stalking, who himself is stalking we don’t know what. For seventeen years he wandered the streets of that city. He was not starving, he could always have found money if he needed it, except, he’d cut himself off from his father’s generosity. When shown a paper with his pedigree, he tore it up. His charm was such that at any moment he could have made his sandcastle, anyway. Rich old ladies adored him, aristocrats vied for his services as tutor to their less-than-illustrious offspring, for he was an inspiring teacher in almost any subject. But he keeps to his own way. He had a room somewhere, donated by an admirer: the rope bed, the table, a couple of chairs, the rope to hang his clothes over. He lived on water, bread, and a few herbs; preferring to sleep on the floor. Where, I suspect, books were piling up. I love him for this foible: he couldn’t help collecting books. Fancy-free in every other respect, he could be weighed down with thick volumes. (At his death, he left a considerable personal library, full of classics, by no means strictly religious.) Scholars were amazed at his knowledge of theology: it was self-taught. The idea of becoming a priest did not seem to cross his mind. At age thirty-six he was more or less forced into it. All his informal arrangements needed to be regularized. The institution Saint Philip founded was thus in a sense forced upon him. It is a strange succession of happy accidents. Long before, he had gathered around him an impressive circle of young men, mostly well-born and of high culture, attracted to him as to a beacon; and to his works, which included selflessly and recklessly caring for the old and ill, the crippled and hapless, the abandoned of all sorts. The combination of this with the literary and musical evenings; with his love of art, and writing of poetry in Latin and Italian; with his rollicking humour, and good-natured practical jokes -- put him quite out of the ordinary. And the “religiosity,” directed to the Mass, in fervid close attention. In the “seven churches” of Rome, in the catacombs, in any church around the corner, there he was, praying everywhere. Saints tend to be obsessive in this way. Saint Philip Neri was irresistible, lovable, in an extreme degree. He had the gift of bringing out the best in people; in almost everyone he met. He had the gift of standing foursquare in the world, and simultaneously beyond this world, without conflict. He was what he was — unique even in Catholic history -- and in his own personal being, a kind of holy contagion. When he died, all Rome was in his power, and the people were told not to pray for him: for it would waste their time, he didn’t need them. Father Robinson gives us a taste of all this, running along the surface; of a man whom every contemporary seemed to recognize as larger than life. He began to change the manners throughout the city of Rome, bottom to top and top to bottom — and yet without any formal remit or authority. He was truly an Apostle, but of a peculiarly modern kind: winning nominal Catholics back to actual Catholicism. But this book is about that only tangentially. It is centrally about “the weight of God.” The mysticism the Saint embodies is not his own achievement or creation. It is not Philip doing these things, but Christ doing them in Philip. In studying Philip, we are studying Christ. To me, Saint Philip, beloved friend and guide, illuminates a saying of Jesus that puzzles most modern Bible readers: “My yoke is easy, and my burden is light.” This scratches our ears as droll indeed, for the burden seems to us impossibly heavy. It would be if we depended on ourselves; and for as long as we must “carry our own bodies” in the sack of our desires. Saint Philip Neri shows the alternative, and Father Robinson strips the distractions away.